The new president called on the South African government to do more to ‘push back against the corrupt advances’ that Israel was making at the African Union. 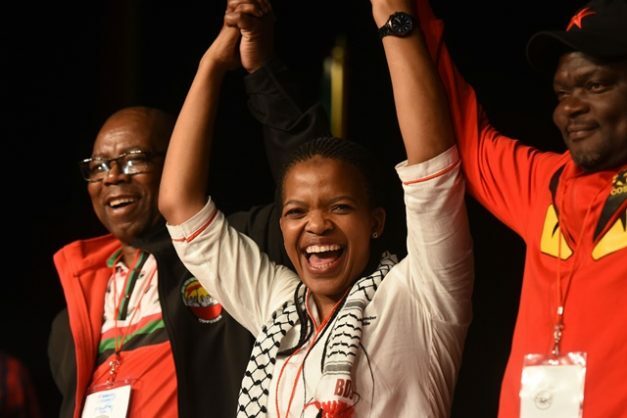 The newly-elected president of the trade union Cosatu Zingiswa Losi has called on South Africa’s ANC-led government to immediately downgrade diplomatic relations with Israel. Losi – who became the first woman to lead South Africa’s largest trade union federation – made the remarks on Thursday at Cosatu’s 13th National Congress in Johannesburg. In her first public speech after being elected president, Losi reminded delegates that South Africa had withdrawn its ambassador from Tel Aviv indefinitely. Afro-Palestine Newswire reported that she also called on the ANC-led government to be “decisive” and fully implement a resolution made at the ruling party’s December congress that called for the immediate and unconditional downgrade of the South African embassy in Tel Aviv to a liaison office. The resolution was a practical expression of the ANC’s support to the Palestinian people, and a means to pressure Israel to comply with international law and end its occupation of Palestine. Losi also called on the South African government to do more to “push back against the corrupt advances” that Israel was making at the African Union (AU). Her remarks were a reference to Israel’s attempt at gaining observer status at the AU in an attempt to improve the Netanyahu regime’s relationship with African states with the ultimate aim of influencing their voting at the UN to block resolutions critical of Israel’s occupation. Palestinian political parties have welcomed Losi’s remarks and Cosatu’s support. Kasim also praised Losi for highlighting Israel’s financial and diplomatic charm offensive in Africa and at the AU. Palestinian Authority (PA) ambassador to South Africa Hashem Dajani attended the Cosatu conference and reiterated the PA leadership’s support for the downgrading of diplomatic relations with Israel. Speaking on behalf of the National Coalition for Palestine (NC4P), an umbrella body representing more than 40 civil society groups in South Africa, Edwin Arrison thanked Losi and Cosatu for urging the government to act on their resolution. “This is a way to express the South African people’s strong opposition to Israeli apartheid and its military occupation of Palestine,” Arrison said. Representing over two million workers, Cosatu and its affiliates have expressed consistent solidarity with the Palestinian struggle and support for boycott, divestment, and sanctions against the Israeli state. In 2009, members of the South African Transport and Allied Workers Union (SATAWU) in Durban refused to offload a ship that was carrying Israeli goods. In 2010, the South African Municipal Workers Union (SAMWU) agreed to engage every municipality in South Africa to boycott Israel.